Bake large UV sets with our UV Tiling feature. It supports the industry standard UDIM and Mudbox file naming conventions. Specify a range of tiles to bake, or choose automatic to bake the full range of your model. Bake your normal maps with confidence. MightyBake lets you pick your target game engine and it will take care of all the details so you can use your map without the need for any post processing or having to load it in a second application to fix the tangent basis. 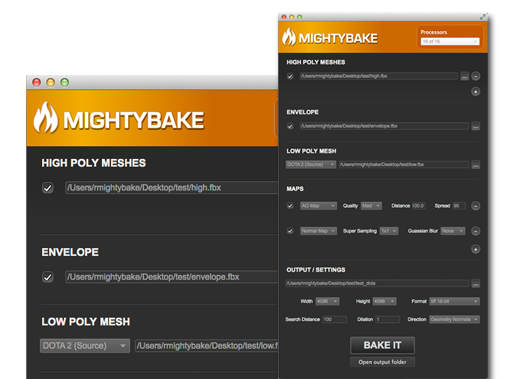 MightyBake's hybrid GPU / CPU accelerated baker maximizes your hardware to bake textures ultra fast. The more cores you have, the faster your bakes. Bake millions of polygons using MightyBake's powerful 64-bit renderer, while capturing every detail with maps up to 8192 x 8192, 16-bits per channel. Have MightyBake output your maps, error free, in the right tangent space for any of the major game engines without a need for a second application.